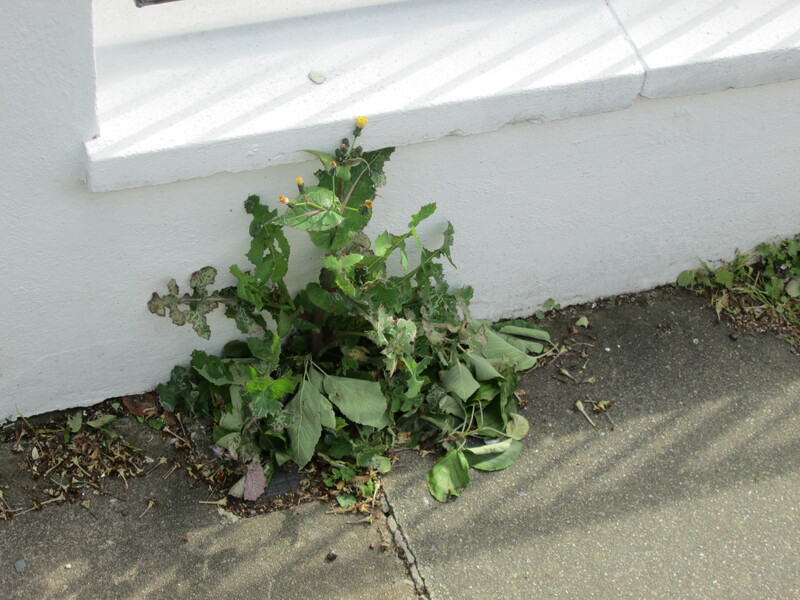 The appearance of Smooth Sow-thistle is not helped by the way that no sooner has it forced its way through the concrete than it seems to be immediately set upon by all manner of other organisms. 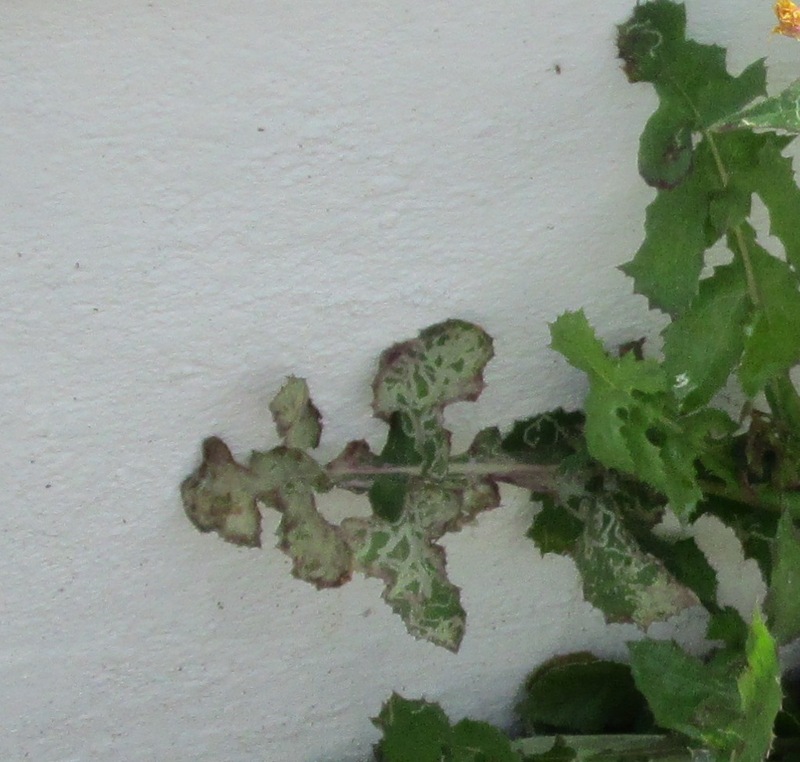 Its lower leaves are often furry with mildew, and, if you look closely, you will see that burrowing insects have taken a fancy to it too – there are pathways where a miniscule grub has munched a path within the leaf itself. There is one species of leaf-mining fly, called Liriomyza sonchi, that is so fond of Sow Thistles that there was some thought of using them as a biological control for the plant in Canada. This is the likely culprit for the white squiggles in the leaf photo above. Tiny grubs, small enough to fit between the layers of the leaf, have chomped tunnels and hallways until they have more or less hollowed it out. Then, they exit the leaf, pupate and hatch into a new fly, to start the cycle all over again. Although Smooth Sow-Thistle looks like the quintessential garden weed, it has a long and illustrious history as a food plant. Pliny writes that, before he tackled the Minotaur, Theseus was feasted ‘upon a dish of sow-thistles’. In her book ‘Wild Flowers’, Sarah Raven describes how Rose Gray of the River Cafe would harvest the leaves of the closely related Prickly Sow-thistle for salad in March and April. It seems that it’s not just the leaf-miner who has a taste for juicy young leaves! The Smooth Sow-thistle is one of those plants that is everywhere, but which is generally unregarded and unloved. It sits up against a wall, munched-upon and covered in fungus, and yet it is described as being useful for all kinds of inflammation, rashes, sores and ulcers (as a poultice) and as a cure for diarrhoea (when taken as an infusion, but note that it acts as a purgative). What I am discovering is that, even here in London, I am surrounded by plants which have had a long relationship with us, and are now sadly neglected, or regarded as a nuisance. With every new plant I identify, I am finding a new sense of connection, of being (dare I say it) rooted in the place where I now live. This entry was posted in London Plants on May 21, 2014 by Bug Woman. This is exciting, I am now the proud owner of the Forager Handbook, and this confirms that lunch may never be the same again . 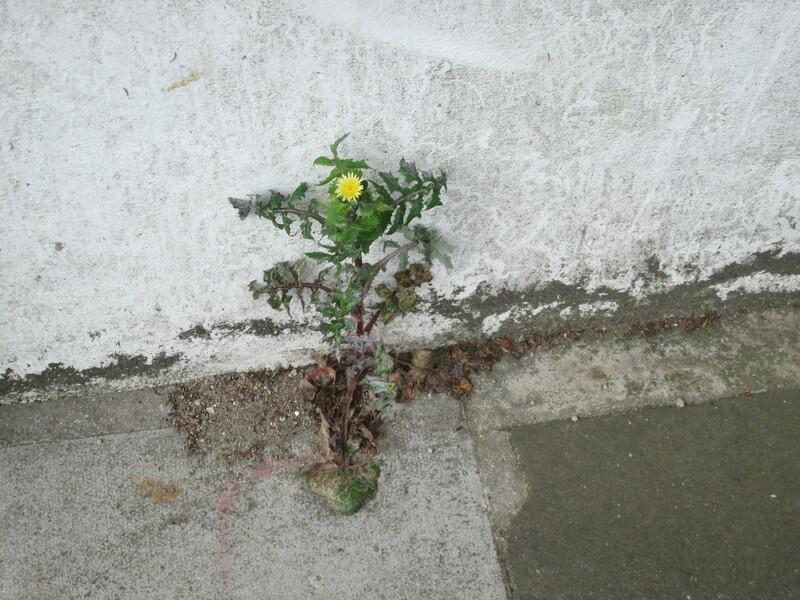 I also like very much , that despite human efforts to crush and subdue all beneath concrete, plants push through undaunted. Yay, Julia…..you’ll be able to make your lunch without once going to a shop! Let me know how you get on. I’m sure I’ve got enough interesting plants here in East Finchley as well, but what with all the dogs and the pollution I’m a bit reluctant, even after washing….